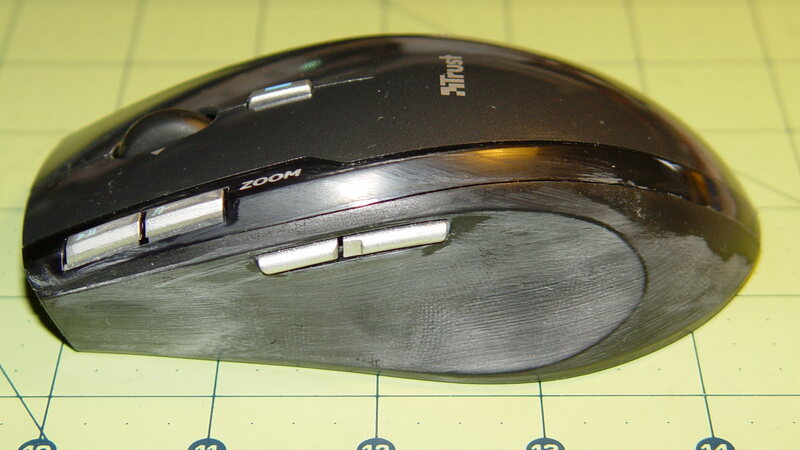 Of course, xylene also wiped away the fancy button markings and irretrievably scarred the surface, but at least I can pick the mouse up without having it stick to my hand. Not that I pick it up that often, obviously. This entry was posted on 2014-11-26, 07:05 and is filed under Home Ec, Machine Shop, PC Tweakage. You can follow any responses to this entry through RSS 2.0. Both comments and pings are currently closed. Xylene, methylene chloride and the toluenes rank as my “avoid if at all possible” organic chemicals. Can’t remember which one is in the spray cans of carb cleaner, but getting some of that stuff on my hands led to a few months of my skin erupting and healing, only to repeat. I’m sooo glad optical desk-rodents got developed. Just checked: the can of carb cleaner features toluene, methanol, and acetone. Acetone strips the oils right off my fingers, so I treat it with some caution, and I’m sure the toluene can’t be good for me. Remember, that burning sensation is there to let you know the carcinogens are working. Oh wait, we all know that products only cause cancer in the state of California and only they seem to know about it? Sort of like the purple onions from Mary’s garden: they let you know they’re good for ya! I had success cleaning the slime layer off of an IC-821 button sheet by several applications of dishwashing soap and water. Seems like it took about four cycles or so of washing, rinsing, letting dry, and repeating. :-) Some of it was thick enough to pull off with tweezers, and that part went really quickly once I started washing. I’d love to know what that layer actually is. Or then again, maybe not. Sounds like I gave up too soon when ordinary solvents seemed to bounce right off. Congrats on your low-hazmat / high-patience technique!